Mathew Lawton III was born in Gulfport Mississippi on November 30, 1971. 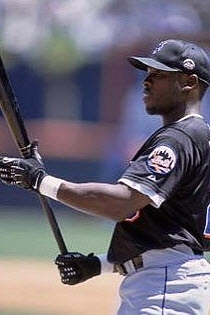 The five ten left hand hitting Lawton was drafted by the Minnesota Twins in the 13th round of the 1991 draft. In 1994 he hit .300 at A ball Fort Meyers & played in the Florida State League All Star Game. As an outfielder he was rated a poor defensive player who sometimes made basic fundamental mistakes. But Lawton did make the best of his abilities and after two brief MLB appearances in 1995 /1996, he became the Twins everyday outfielder by 1997. He had some good hitting seasons with the Twins, batting over .300 twice & hitting over 35 doubles three times. The speedy outfielder scored over 90 runs three times in his career and stole 23 or more bases four times. He drove in over 60 runs five times & manged to hit 15 or more HRs four times. 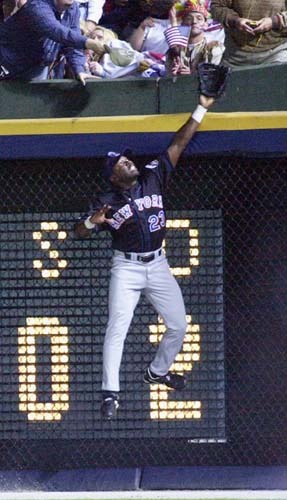 He had his best season in 2000 making the All Star team, batting .305 with 44 doubles, 13 HRs and 88 RBIs. He was batting .293 through July of 2001 when the Twins traded him to the New York Mets for the popular pitcher Rick Reed. Lawton made his Mets debut on August 1st in an 8-2 Mets win in Houston over the Astros. In that game Lawton had two hits & drove in a run while scoring another. 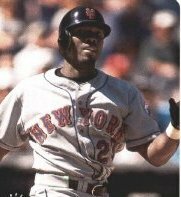 On August 12th he hit the first of his two Mets HRs, scoring the only run of a 4-1 loss to the St. Louis Cardinals. On August 26th his double broke up a 3-3 tie in the home 7th inning. The Mets went on on to barley win the game 6-5. In an early September series sweep over the Florida Marlins, Lawton had six hits with three RBIs. Lawton would only play in 48 games as a Met right fielder, as his average dropped to .246 in 183 at bats, with 3 HRs 11 doubles & 13 RBIs. That winter he was involved in a multi player trade going to Cleveland with Alex Escobar for Roberto Alomar and a couple of minor leaguers. Lawton spent three season in Cleveland, having his best year in 2004, batting .277 with 20 HRs & 70 RBIs making his second All Star team. In 2005 Lawton got caught up in a steroids scandal, he apologized and admitted using horse steroids. He finished his 12 year career in 2006 batting .267 with 1273 hits 138 HRs 267 doubles 631 RBIs & 165 stolen bases.